Do you leave your site footer at the mercy of the Genesis default settings? Most often that’s not the case. When we deploy sites the footer is often the most neglected part of the design in the customer’s requirements. That’s where we come in and advise about the utility of a good footer. One of the most usable elements however can be a menu in the footer. This menu allows you to present a link back to the homepage of the site, a sitemap, the “About Us” page and the “Contact Us” page. The usage varies by site owners. Genesis provides you some great hooks and filters to customize the site footer. You can customize your child theme and place the code in the functions.php to do the same. However customizing the footer is such an essential task yet cumbersome that we felt it could be simplified. Site’s Brand Name: By default, the plugin uses the site title in the footer credits. This setting allows you to use custom brand name in place of site title in the footer information. Copyright Date(s): By default, the plugin displays the current year in the copyrights. This setting enables you to specify a custom year for the copyright notice. It also allows you to use from-to date format. Disclaimer Link: Similarly, you can select the “Disclaimer” page from the dropdown and the plugin will include the link in the footer information. Footer Menu: Besides copyrights notice, credits and footer information, Genesis Footer Builder also enables you to add quick links to the footer in the form of footer menu. Just create a WordPress menu and assign Genesis Footer Builder Menu location to add footer menu to any Genesis child theme. If you plan to go pro you don’t need to touch your functions.php yet. That little text area at the bottom allows you to use custom html and Genesis shortcodes to customize the Genesis footer area further. 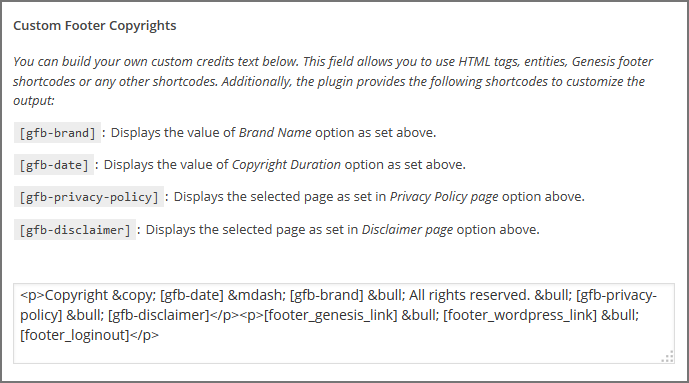 To take the footer customization a little further, the plugin also provides the shortcodes for each of the settings so that you can customize the footer output like a power user! The good thing is that it supports Genesis footer shortcodes out-of-the-box. 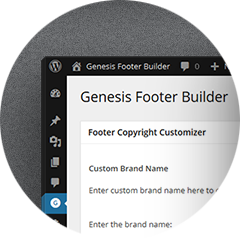 Here’s a tutorial on how to use Genesis footer shortcodes in Genesis footer builder. The Genesis Footer Builder makes customizing the footer so simple you’d want to have it in your list of basic essential plugins for every Genesis site you launch. A professional usable footer for Genesis with a simple plugin.